When circumstances challenge us to do something that we feel is beyond our capabilities, we can have two choices: We can focus on solutions and proceed in conquest, or we can withdraw in defeat. We all experience the night and day sequences, seasons of happiness and moments of sorrow in Life. 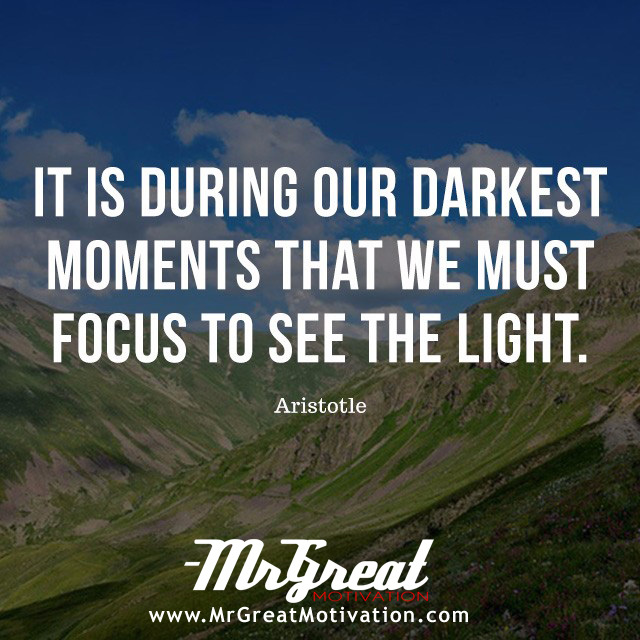 When we find ourselves in the “dark” times, we give up easily, it is our perceptions that will direct whether we pull through or live for a season in sadness and despair. It is always our choice. We can stir the coals of fire that remain within our being drawing warmth and hope for another day or we can sit back and curse the circumstances. Once again as with most everything in life, it is our choice. We can focus what we can do and accomplish in our own power, in our own knowledge and great motivation towards our own abilities. Focusing on circumstances and regrets just make the darkness darker and the outcome more hopeless. Focusing on light coming from the end of the tunnel and believing that whatever is brought to the light becomes the light and can no longer bring us harm will lead us to joy. Let us look for the light and try on become the light to someone who is stuck in the dark places of light and help lead them to victory.